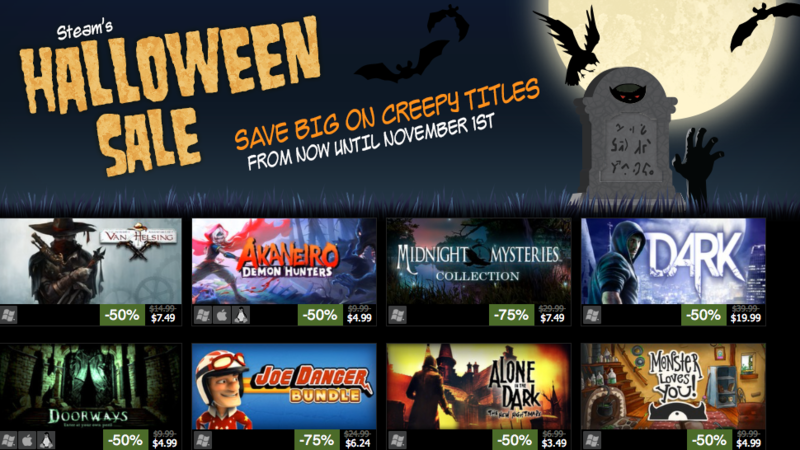 Steam Halloween sale has begun providing a huge discount on a quite large number of games. Rush to Steam store guys and hurry it up because the sale going to last only till 1st November. This could be the best chance to get cheap games right now before the Black Friday sale arrives. Steam is well known for its unmatchable sales, Valve never misses a chance to please its customers by providing massive sales on Steam games. In the wake of Halloween, Steam sale is once again live, this time bringing a discount of up to 85% off on scary, creepy and zombie-filled games for PC. Steam Halloween sale covers almost 150 games and game collections for Microsoft Windows PC and Mac. The sale includes some very quality and worth spending on titles, you can get Fallout 3 for as low as $4.99 and Dead Space pack for $8.74, prices for both the titles are on 75% discount. The sale also includes some recently released titles such as The Wolf Among Us, which is selling out for $22.49 and Outlast, available for $13.32. Go grab your stuff now before the ends on 1st November 2013. For the complete list of on-sale games, visit Steam Store.